Award Winning Indie Novel – A Great Summer Read! Check out this press release for my latest novel, A Brief Moment in Time! CALGARY, AB, July 03, 2012 /24-7PressRelease/ — Novel Ink Publishing is pleased to announce author Jeane Watier as the 2012 Independent Publisher Book Award gold medal winner for visionary fiction. A relatively new genre, Visionary Fiction has been defined as fiction in which the expansion of the human mind drives the plot. Awards were presented at the 16th annual Independent Book Award ceremony on June 4th, 2012 in New York. The “IPPY” Awards, launched in 1996, were designed to bring increased recognition to the deserving but often unsung titles published by independent authors and publishers. Established as the first awards program open exclusively to independents, over 2,500 “IPPYs” have been awarded to authors and publishers around the world. It is now the world’s Largest Book Awards Contest. Praise for A Brief Moment in Time: “I’ve just finished reading your latest masterpiece and am speechless. I’m not sure if it is the similar experience I had emerging from a coma, but this book touched me. I resonate with it so much!” – Cristy Lynn Hayden, author of Love and Accept if All, A Journey from Near Death to Bliss. “Finished your book (A Brief Moment in Time) last night. WOW! I loved it. Many golden nuggets of wisdom sprinkled throughout a brilliant storyline.” – Lisa Francis, Bright Lights Marketing. Jean Watier lives in Calgary, Alberta with her family. She has been studying metaphysical concepts, particularly the Law of Attraction, for many years. Her desire to share what she’d learned blended with her love of fiction and her passion for writing. The result: powerful novels that teach while they entertain, and transform lives as they captivate readers. 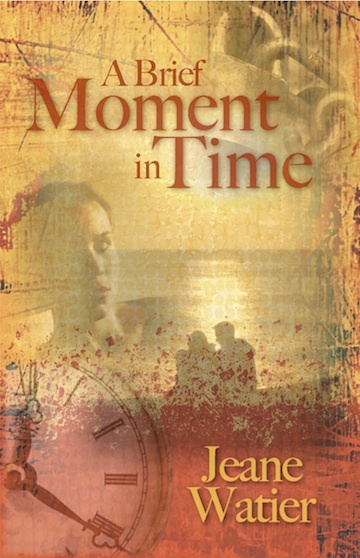 All of Jeane’s books – including her latest novel, A Brief Moment in Time – are available in paperback and e-book formats through Amazon and other major online booksellers. I’m not surprised…really. And yet when something big happens – even when you have that “feeling.” You do what you know works – you believe, you release resistance, you receive. Still there’s that, “Oh my God! I can’t believe this is really happening.” sensation. If you haven’t heard (Really? I’ve been telling everyone!) I just won an international book award for my latest novel, A Brief Moment in Time. In exactly three weeks, I’ll be in New York Receiving a gold medal at the Independent Publishers book awards ceremony. I’m all tingly and excited. But wait a minute! I created this. I desired to see my books go to the next level. I felt inspired to submit this particular book to the biggest book award contest in the world. I even practiced saying, “Award Winning Author of Visionary Fiction.” It sounded really good, so I prepared a new image for my Facebook page adding the words by my picture – and within an hour of being notified that I had won, I posted the new image for all to see. Maybe this is just the beginning, (it feels like it is), or maybe I’m not used to my desires manifesting – the big ones that is. Little stuff shows up all the time. Or maybe I’m finally beginning to realize that there isn’t any difference to the Universe. It’s only big or small in my mind – and as long as it remains BIG!!! in my mind, it can’t manifest in my reality. Winning an award, having my books acknowledged in a bigger way was the next logical step. And I’m so excited to be on this journey. What’s next?? Well, I’d say it’s a contract with Hay House’s new fiction division!! I’ll keep you posted. 2. A word about companies that offer to publish your book for a fee (often called Vanity Publishers): While some publishing companies are set up to assist self-publishers and do offer valuable services, others are merely a money pit. Find out exactly what you will be receiving for your money, what services they provide (or expect you to provide). Get a detailed quote up front and definitely ask for references!! With my first book, Life’s Song, I was glad to have someone hold my hand through the whole experience, but the overall cost was considerable. With A Song of the Heart, I went with the same company, but just made use of their editing services. Now I’m my own publisher and do nearly everything myself, but I still call on a professional when needed for graphics or final proofreading. Know your strengths, be willing to learn, and don’t hesitate to ask for help when you need it. 3. Why self publish? The bottom line…control. You decide what and when and how. You have a vision; you know what you want to say and how you want the finished product to look. Sure, you’ll get advice along the way, but the final decisions are yours. And you get to choose how quickly you get your book to market. can take your book from finished manuscript to major online bookstores in a few short weeks. You can still order a quantity of books to have on hand and sell yourself, but the beauty of Print on Demand is that a book is not printed until an order is received, and then it is shipped directly to the reader, or the retailer that orders it. Finally, you can earn the right to be noticed by a traditional publisher. Hay House’s POD division, Balboa Press http://www.balboapress.com/Packages/CorePackages/Compare.aspx, claims that their titles are monitored regularly by the parent company in hopes to find new aspiring authors to add to their catalogue. 4. If you’re planning to order books to sell/market, shop around. The cost of printing can vary significantly. While the benefits of POD are great, the cost to order a quantity of books through them can be higher than regular digital or off-set printers. My first book was printed through a local printer and the cost to print was nearly $7/book for 500 copies. I changed printers for my second book and paid just over $4/book for 250. Even though the books had to be shipped across the country, it was worth it. These printers, however, didn’t give me the link I needed for online exposure (one of them claimed to but it ended up costing me money just to sell a book on Amazon). So a combination of the two methods may be the best solution. I find that Lightening Source gives me the best online exposure and if I want to order books to have on hand, I do a print run through the less expensive printer I found. There’s no difference in appearance or quality, just price. When you’re getting quotes, know your book size, # of formatted pages (the number that shows up at the bottom of your Word document), desired paper weight (typically 50 or 55lb for B&W), cover weight and finish (matte or gloss). Then clear a space in your house, 500 books takes up a fair bit of space and a cold garage or damp basement isn’t the best location. 5. There are getting to be more Print on Demand companies all the time, so check out what they offer. The differences can be subtle, but important. I’ve found Lightening Source (LSI) great to work with. They don’t hold your hand (as a publisher, you’re expected to know a thing or two) but when I asked questions they were friendly and answered them fully. With Ingram as their parent company, LSI’s distribution channels are the best I’ve seen, and the process of getting your book online or in their catalogues is easy. A friend of mine published with Create Space initially and then switched to LSI because she couldn’t get her book on Amazon.ca. Another SP author mentioned that while Create Space was created to cater to new authors and does “hold your hand”, they are, in essence, your publisher and hold certain rights to your book. Lulu and Balboa are a couple of other contenders I’m aware of. Check out their websites. All of the POD companies can provide ISBN and barcode. Most offer packages that provide basic proofreading services all the way up to completely editing your book and designing your cover. 6. Ask yourself, “What do I want out of this?” Do you want your books in bookstores, online, or both? To be attractive to the big bookstores, you’ll need to price yourself right and set your commission at 50% or less or they won’t even look at you. You also need to make your books returnable (Stores want to be able to send your books back for a refund if they don’t sell within a certain time) so keep that in mind when you’re filling out the forms. For example, with LSI, I set the discount for my books at 20% and I check “no” in the returns box. It means the big brick and mortar bookstores won’t look at me, but it gets me on all the major online bookstores with 80% of the cover price coming back to me. The checks I’m getting regularly now from Lightening Source prove I’ve made the right decision. I’ve created a Fan page on Facebook: http://www.facebook.com/jeanewatier and spent time there creating a presence and making contacts. I’ve done some inexpensive advertising – PRWeb: http://www.prweb.com/, Facebook adverts, and a magazine that is running my ad for two months. My sales have already increased dramatically and I’m just getting started!! Pricing your book right means finding the balance between profit and saleability (too high and people won’t buy it; too low and you won’t cover your own costs). Generally people will pay more for information than for pleasure when it comes to books. They see nonfiction as an investment whereas a novel or a book of poetry is an indulgence. Spend some time in a bookstore and take note of prices (as well as size, design, cover layout, etc). Size matters. Check with your printer or POD company before settling on a size for your finished book. PODs have a range of cover sizes for you to choose from. Printers can trim your book to any size, but some sizes are cheaper to print than others. An ISBN (International Standard Book Number) is essential if you want to sell your book. In Canada, they are free and as a publisher you register with CISS: http://www.collectionscanada.gc.ca/ciss-ssci/index-e.html and receive a block of numbers. In the US, go to: http://www.isbn.org/standards/home/index.asp. Cataloguing in Publication, CIP, is not required,but including that information on your copyright page will allow you to sell your books to libraries. In Canada go to: http://www.collectionscanada.gc.ca/cip/index-e.html . You’ll need a barcode on the back cover of your book if you plan to sell in stores. Barcodes are created using your ISBN and (optional) the price of the book. Most printers and PODs will provide this at no cost or for a small fee. Finally, if you’ve written a book that you plan to self-publish, market and sell, then you are your own publisher. Come up with a name for your company and incorporate. 9. Preparing files for print: Your manuscript is edited and proofed. Your book-size format is complete with title page, copyright page, index, preface, etc (called front matter). You’re ready to upload (or submit a hard copy of) your book to be printed. Most printers now accept pdf files of both your text and cover. If you do this yourself, keep in mind that when you print to pdf (from Word) or share -> export (from Pages), you need to choose the highest quality setting. Your cover file needs to be in CYMK color format, with all fonts converted to curves (outlines). If this sounds too complicated it’s best to have a professional review your files. Most printers and POD companies such as Lightening Source standardly review files to make sure they’re acceptable for print, but they also have in-house design people that can help you with any necessary changes. Finally, always, always request a proof. It’s your last opportunity to catch any errors in formatting, see how the cover looks, and hold the finished product in your hands before you order a large shipment or give the go-ahead to distribute on Amazon. It’s worth the extra cost!! 10. eBooks: Wow. There’s so much to be said on the subject! If you want maximum exposure for your book, this is one market that can’t be overlooked. There are various ways to make your book available as an ebook. Ask your printer; they may offer this service. Lightening Source does. However, you can do it yourself without to much difficulty. Starting with a basic (unformatted) manuscript, you can have your book available on Amazon Kindle in a few easy steps. And it’s free. Go to Kindle Direct Publishing:https://kdp.amazon.com/self-publishing/signin. If you want your book available on iPad, Nook, Kobo, and Sony Reader, to name a few, you can have your book converted into the necessary formats and have complete coverage. Having said that, consider that Kindle has almost 70% of the eBook market and offers free reading apps to use on a PC, Mac, iPad, iPhone and Blackberry (so your readers don’t even need to own a Kindle device to download and read books from the Amazon Kindle site.